Frederick (population approximately ) is located in western Illinois in the southeastern portion of Schuyler County. Illinois Route 100 is the main roadway to and from Frederick. Illinois Route 13 intersects with Route 100 at the town of Frederick. The Burlington Northern Railroad runs to the east of town. The Illinois River flows just to the east of the current hamlet of Frederick. The river was an important reason for the early development of the town. "In the early thirty's (1830s) soon after the first steamboats began to ply the river George Frederick Jonte and Frederick Merchant, two Frenchmen located on section 17, in Frederick Township and decided to found a city that would be the shipping point for all the rich inland country to the north and west. Allen Persinger was employed to plat the town, which he did May 12 and 13, 1836, and in honor of its founders it was named Fredricksville, and is so recorded on the Court Records but the United States Post Office department in 1892, shortened its name to the name of Frederick." "The first school in Frederick was held in a private cabin built by Horatio Benton in 1845. The first school house was built in 1846, a small one-story frame building which was afterwards used as the town hall. 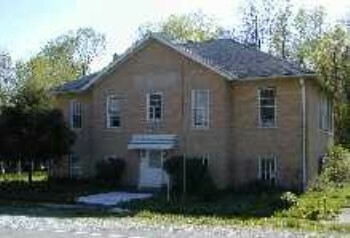 In 1871, a two story brick school building was erected which burned down in 1929. The present school building was built in 1929 and was nearly completed when the old one burned down." 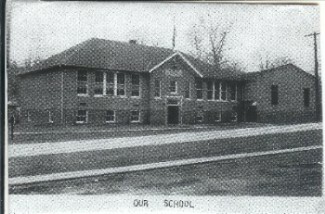 Frederick residents started a two-year high school for their children in 1927. 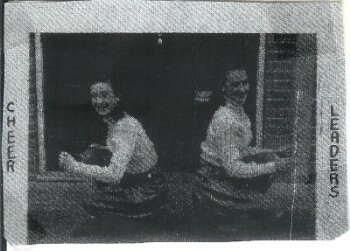 This school served the town through the mid-1940s. 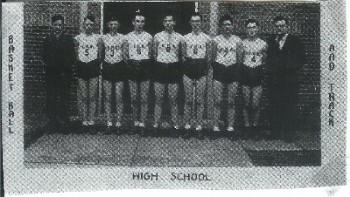 It is believed by former student George C. Egbert that Frederick High School closed in 1944. The high school building today is used as a living quarters or private residence. "We never had an indoor gym - we played and practiced outside on a clay basketball court. We also had girls basketball team. Mr. Ogilvie was the only teacher for the high school." "The Frederick High School Basketball Team had a very successful season. We entered in the Schuyler County Basketball tournament which was held at Browning, Ill. We received a second place trophy. The High School girls played several games with the Independents Girl's team during the season. The High School Team bought new blue jackets. The emblem was a spread eagle." Frederick High School likely offered other activities as well. If this is the case, please contact us via the means listed below so we may share this information on this page.